Lucille Johnson Medders, age 92, of Baxley died Monday, November 12, 2018 in the Pavilion. Mrs. Medders was born March 3, 1926 in Appling County to the late Clinton “Clint” Johnson and the late Mamie Aldridge Johnson. She was a member of Satilla Baptist Church and was a homemaker. Mrs. Medders was preceded in death by her husband, Silas Jackson "Sonny" Medders, a sister, Leotis Johnson Muller and brothers, Floyd Johnson, Linton Johnson, Malcom Johnson and Dupree Johnson. She is survived by her sister, Mary Johnson Miller & husband, Herbert of Jesup. Several nieces and nephews also survive. Funeral services will be held Thursday, November 15, 2018 at 11:00 a.m. at Satilla Baptist Church with Rev. Todd Crosby & Rev. Scottie Pitts officiating. 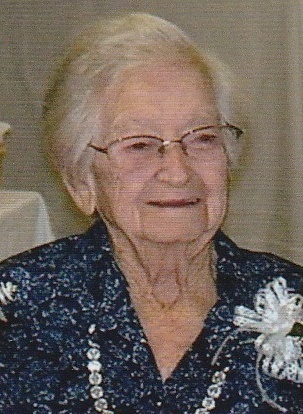 Mrs. Medders will lie in state one hour prior to the service at the Church. Interment will follow in Satilla Baptist Church Cemetery. Active Pallbearers will be Eric Mincey, Russell Griffin, Ricky Worth, Daryl Everett, Rocky Courson and Stacy Crosby. Honorary Pallbearers will be the Satilla Baptist Church Senior Adult Sunday School Class, Satilla Baptist Church Deacons & Wives, Lafayette & Sherry Crosby, Gene & Betty Sparks & Dr. Errol & Denise Graham. Visitation will be Wednesday evening 6:00 until 8:00 p.m. at Swain Funeral Home. Remembrances maybe made to Satilla Baptist Church 5525 Satilla Church Road, S.E., Baxley, Ga. 31513 or a Charity of Donor's Choice.